In an attempt to push some older unanalyzed files through the pipeline we encountered data that could not be successfully preprocessed or split. This has resulted in work distribution going to near zero. We are currently transferring newer files from off site storage and soon will be receiving a disk shipment from Arecibo. Once these data are on hand work distribution will pick up. Message 1150114 - Posted: 8 Sep 2011, 16:58:47 UTC - in response to Message 1150111. Thanks for the info Jeff!!! Thanx for the update Jeff ! a lot of people screaming for WU's...should relax a little and realise this is a volunteer project and gaining credit isn't the point of it all. If "we" find ET in my lifetime I'll be the happiest man alive. That's all there is to it. Keep up the good job guys !!!! Thank you very much for the update, Jeff!!! Message 1150160 - Posted: 8 Sep 2011, 19:15:09 UTC - in response to Message 1150111. Thanks for the update. By any chance could you tell us if the data from the GBT is being sent out yet. Also, thanks for the hard work in getting the project back up and running. Everything working just FINE on my end !! Message 1150229 - Posted: 8 Sep 2011, 22:08:19 UTC - in response to Message 1150111. Thanks for the update. 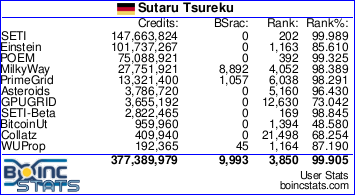 I wondered why my Boinc manager kept telling me there was no data to process! Thank you for seeing this all the way through to the fix. Excuse me for asking a STUPID question, but why isn't the data transferred through the internet directly to you at Berkeley? Sneaker net from Areceibo isn't the most efficient way of transferring data. Please forgive. Meesa so stupid. Message 1150394 - Posted: 9 Sep 2011, 13:07:49 UTC - in response to Message 1150346. The data is recorded at the Arecibo satellite dish onto hard drives. Because we're talking about hundreds of gigabytes worth of data, it is actually faster to ship the hard drives to Berkeley than it is to transfer the work across the internet itself. Ironically enough, once the hard drives are received at SETI@Home's lab in the Space Sciences Laboratory in Berkeley, the raw data is then transferred to a secure offline storage via the internet. If at any time they need more data, they simply download the raw data files back into the lab to be split and processed as workunits. I'd imagine it would be possible to connect a fat internet pipe directly from Arecibo to Berkeley, but somebody would have to pay for it. While people may be tired of hearing about it, the truth is SETI doesn't have that kind of money to be paying for big projects like that. I'm not really sure it's practical to get an internet connection from Arecibo to Berkeley when there's more pressing matters in need of attention. Thanks for keeping us in the loop. Feel free to send me some unsplit data... Ill take care of it on my end. Message 1150443 - Posted: 9 Sep 2011, 15:49:15 UTC - in response to Message 1150394. I wonder if a dfs or a p2p setup would be a viable option so as to "buffer" the transfer of data instead of letting it pile up. Use your volunteers to pull the data to share the load and have them send it to Berkeley(or wherever) to be processed and then sent back to the volunteers for computation. A lot of turns in the road, sure, but before you scoff at the idea, name a better one than the possibility of losing all your data in an unforeseen transit accident. Message 1150454 - Posted: 9 Sep 2011, 16:27:20 UTC - in response to Message 1150443. 1) It would be possible to "poison" the data, making it hard to prove the claim if an alien signal is found. There will be peer review to contend with. The data needs to be controlled a bit better. 2) The internet pipe that we all use to upload/download data is already saturated most of the time. Adding in your dfs or p2p idea would make the situation worse. As it is, the data is backed up into a private cloud using a separate internet connection than the one we use for our upload/downloads, so it doesn't have to fight for contention with user's traffic. If I were a scientist on the project, I would trust data backups more than I would dfs or p2p. Several data drives did arrive from Arecibo today. These files are now being moved into the pipeline. Message 1150495 - Posted: 9 Sep 2011, 18:35:23 UTC - in response to Message 1150454. Look, may it be p2p or dfs, either is probably not the best of ideas regarding our current situation - nor one I would use for data retention on this sort of project... initially. Having said that, if at all possible I would be doing this before I start shipping my primary data physically... even down the street. But by having some sort of stream out of any of the antennae to people in the project or the volunteers, it would be a step in the right direction to where the future of the world's corporations and companies are going. Money is said to be a hindrance... Sure, but I am not so sure the argument on the size of the pipe needed can be given till an accurate monthly amount of stored data is given. Bids for the bandwidth required to transmit said data over the course of a month will, in turn, follow. I would imagine that if looked at correctly, there would be the possibility of data transmission as a primary. Especially in today's world where the Mb is getting cheaper and cheaper via the demand. All I know is that eventually all of it will be pushed (via dfs or equivalent) to a cloud or private data center. It's not going to happen tomorrow so the question posted here was asking, more simply, what can we do for the interim? We are the volunteers here..